The PR Series Leveler is a premium, high quality, pit style hydraulic dock leveler. The hydraulic controls and actuators are designed specifically for dock levelers and include features such as a tamperproof velocity safety fuse, and low pressure, double sealed, ram design lifting cylinders with a chrome plating to ensure a long service life. 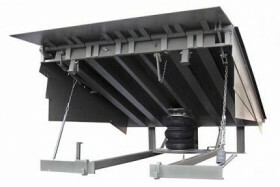 The “VS” Series hydraulic dock leveler is a vertical storing leveler. There are a number of significant benefits to storing the leveler vertically. Trucks with hinged trailer doors can back right up to the building, without stopping, and open the doors inside the building, reducing downtime and improving security. 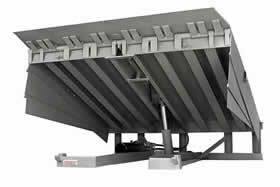 The “HM” series mechanical dock leveler is ideal for heavy duty applications where superior strength is required. The Cam Control™ Counter Balance Assembly uses a precision lifting roller and metered cam assembly to ensure smooth operation.